The Reflections Arts Program has six categories – dance choreography, film production, literature, music composition, photography and visual arts. A student may enter as many categories as they wish but may only submit one entry for each category. More information can be found on the National PTA Reflections website: www.pta.org/home/programs/reflections. 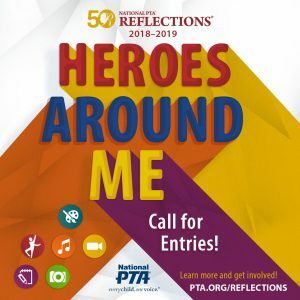 The Student Entry Form is attached and the Theme this year is “Heroes Around Me”. This is the only form excepted with each entry, forms from past years will be returned. Attach with paper clip or roll up in a rubber band, please no Staples!! No names on the front of artwork. Get your submissions in by Dec. 7th! !